RVHD and RVHD2: A possible case of Rabbit Viral Hemorrhagic Disease in pet rabbits in the UK or Europe, with a discussion of pet vaccines for rabbits. Whenever a rabbit dies suddenly for no good reason, and especially when a second rabbit dies in the same manner, suspicion falls on RVHD as a culprit. RHD, as it is known in the USA, is extremely rare in the western hemisphere (US, Canada, Mexico, South America) because extreme measures are historically taken immediately upon recognizing an outbreak. 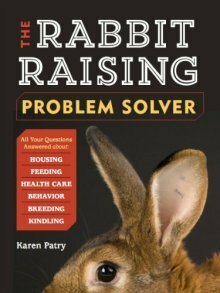 We provided information about RHD and how to handle an outbreak in the US here: www.raising-rabbits.com/rabbit-hemorrhagic-disease.html. Raising-Rabbits received an inquiry recently when two of the visitor's rabbits died suddenly and in quick succession. Suspicion immediately falls on this catastrophic viral illness. This page is written in response to that inquiry. Perhaps it will be helpful for our other visitors who live in the United Kingdom, Europe, Australia, or other area where either or both VHD and VHD2 are endemic. 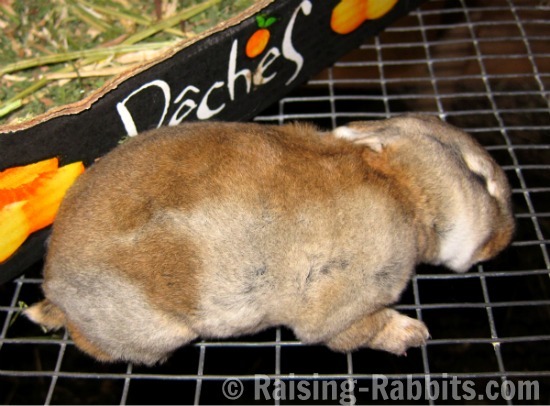 "I had 2 velvet rex rabbits, male and female. First one died on Sunday; the day before he was fine. I went out on the Sunday came back to find the male just laying there spread out unable to move. When I picked him up he was all floppy. I took him to the vets; while in the car he quickly started to degrade on me and then died just before we reached the vets so we have sent him for a postmortem. "The next day in the morning the female was eating happily and hopping around. By 6 o'clock it had the same symptoms so I rushed to the vet and the vet said she has about an hour to live and it could be an intestinal virus. They had both had their injections and I had to let them put her down. "Now I have four 7 week old babies in the hutch. I'm taking them to the vets today. At the vets they said over the weekend they have had multiple rabbits come in with the exact same thing but they don't know what it is. Please get all rabbits checked as this could be a new virus killing our beloved bunnies." Sorry to hear it, Anon. Your vet thought it was possibly intestinal in nature, and recommended vaccination. Vaccination is recommended for only two viral diseases that I know of: myxomatosis, and rabbit viral hemorrhagic disease (also known as VHD, RHD, RVHD, or calicivirus), but neither of these is necessarily intestinal. You didn’t mention the pustules of myxo, nor the bleeding of VHD, although acute VHD doesn’t show any bleeding. The VHD virus affects the lungs, but also damages the liver and other abdominal organs such as kidney and spleen. Clearly, the scenario that you describe at your house is highly suggestive of Rabbit Viral Hemorrhagic Disease, despite vaccination. And now there is a new strain of RHD found everywhere in England and Europe, known as RVHD2 or RHD2 or VHD2. Comments in the vet office circumstantially support either possibility, given the sudden illnesses and deaths of many other pet rabbits in the area over the same time frame as your now deceased rabbits. This is likely the virus your vet was worried about. RHD1 kills 90% of its victims. RHD2 kills 20-25%, although this is believed to be due to prior vaccination for RHD1. There is some evidence that RHD2 is becoming more deadly. Rabbits get sick after exposure twice as fast with RHD1: 1-3 days vs. 3-9 days. Necropsy results tend to be more severe or obvious with RHD1, for example, obvious bleeding in the liver. Liver bleeding may not be so obvious in cases of deaths from RHD2. In RHD2, bleeding under the skin can be seen before death. This might be due to a longer time of illness before death. Rabbits with RHD1 may die too quickly for this condition to develop. Rabbits with either strain might bleed from the eyes, nose, or mouth. This sign might also only appear after the rabbit has actually died. RHD2 can infect and kill rabbits of any age, where youngsters seem to be protected from RHD1 up until age 8-10 weeks. If the rabbit survives the initial onslaught of the disease, it will likely demonstrate evidence of severe liver damage such as losing weight and becoming jaundiced (readily noticed when the whites of the eyes turn banana-yellow); the rabbit will then succumb within three weeks. See this August 2016 news story describing an epidemic of RVHD2 in the UK. In the United States there are no jabs to be had for viral illnesses; this is the realm of Australia and Europe, including the UK. The Rabbit Welfare Association in the UK strongly recommends that all rabbits remain completely up to date with vaccinations and that bio-security measures be followed when you intend to mingle rabbits or introduce new rabbits to your home or herd. Additionally, a new vaccine containing both strains of VHD has been licensed in Europe and is newly available in the UK. RVHD2: The UK's Newest Fatal Rabbit Disease is an article providing history, some vet info regarding the new strain of VHD, details about the various vaccinations, the latest vaccination protocols as of 2017, and how to apply bio-security methods to your own situations. The article also provides links to more info should you need it. Don't we all wish for a silver bullet that will save all our rabbits! Unfortunately, vaccine immunity provides only imperfect protection, although even this is better than nothing compared to the devastation of either myxomatosis or RVHD. Currently, around 25% of rabbits up to date on vaccines for RHD1 but newly exposed to RHD2 will still die. Vaccination for RHD2 improves survival rates, but even so, a certain percentage of rabbits do not respond to the vaccine. This is true for all vaccines, in both rabbits and humans. Viruses mutate quickly and a lot, which is why vaccination isn't quite the magic solution we would hope for. This propensity to mutate is why there is a new strain of RHD, and the vaccine may even have contributed to its ability to mutate. For now, however, vaccination seems to be the only protective option for either myxo or RHD. Just know that the time may come when RHD3 causes the next epidemic of rabbit deaths, and the rabbit world scrambles for a new RHDV-3 vaccine. Hopefully that time is still years away.